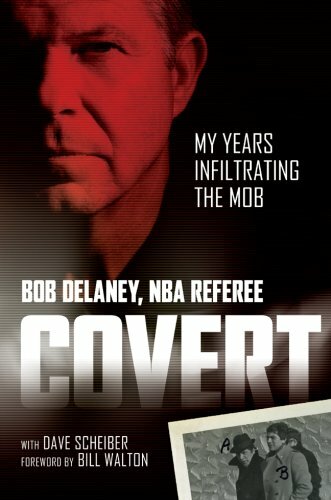 Order ‘Covert: My Years Infiltrating the Mob’ by Bob Delaney with Dave Scheiber, available from Amazon.com by clicking on the book cover above! Bob Delaney has lived not one but two enviable and intimidating lives—and he’s nowhere near done, yet. In his first career, Delaney was a New Jersey State Trooper who went undercover for three years to infiltrate the Mob in the Garden State. Forget Tony Soprano—this was the real thing. He traded in his given surname, Delaney, to become “Bobby Covert, a crooked trucking executive. As Covert, Delaney gathered enough evidence in the mid-1970s to convict 30 members of the Genovese and Bruno crime families. When that assignment ended, it took Delaney a while to leave his assumed identity—and personality—behind as he dealt with a form of post-traumatic disorder. One of the ways he accomplished it was refereeing basketball games, of all things. Like everything he has ever tried, Delaney stood out as a ref. He moved up from one league to the next, soon catching the eye of an NBA official. Jersey Shore League games led to the old Continental Basketball League and pretty soon, Delaney retired from the New Jersey State Troopers to be a full-time NBA referee. Last year, Delaney published a book about his exploits in both gangland and the land of the giants. That book, Covert, written with my good friend and award-winning St. Petersburg Times sportswriter Dave Scheiber, was just published in paperback. Order ‘ Surviving the Shadows: A Journey of Hope into Post-Traumatic Stress’ by Bob Delaney with Dave Scheiber, available from Amazon.com by clicking on the book cover above!